Ernest Hemingway is one of a small class of writers, along with names like Dickens, Austen, and Proust, who can simultaneously terrify and excite a reader. Perhaps most like Jane Austen, we’re often judged not by which of their books we’ve read but whether we’ve read something by them. It’s the mark of a truly great author that one can’t choose a single piece of work, like we might with a Fitzgerald or Salinger. For me, Hemingway has always been a name that I feared to read. His works seem weighty, almost too highly revered even among “books you must read” lists. The beauty of my reading project is that I must meet head-on writers whose names are new to me as well as those I’ve long avoided tackling through one fear or another. Published in 1940, For Whom the Bell Tolls is based on Hemingway’s experiences during the Spanish Civil War, which had ended the previous year. Like the earlier A Farewell to Arms, it follows a love story against the backdrop of a major and recent conflict. For Whom the Bell Tolls tells the story of American Robert Jordan as he fights for guerrillas during the war. Experienced with explosives, Jordan is set to destroy a key bridge but finds the local resistance difficult to work with. He also begins to fall in love with a Spanish girl, Maria, who has lost her family to the fighting. 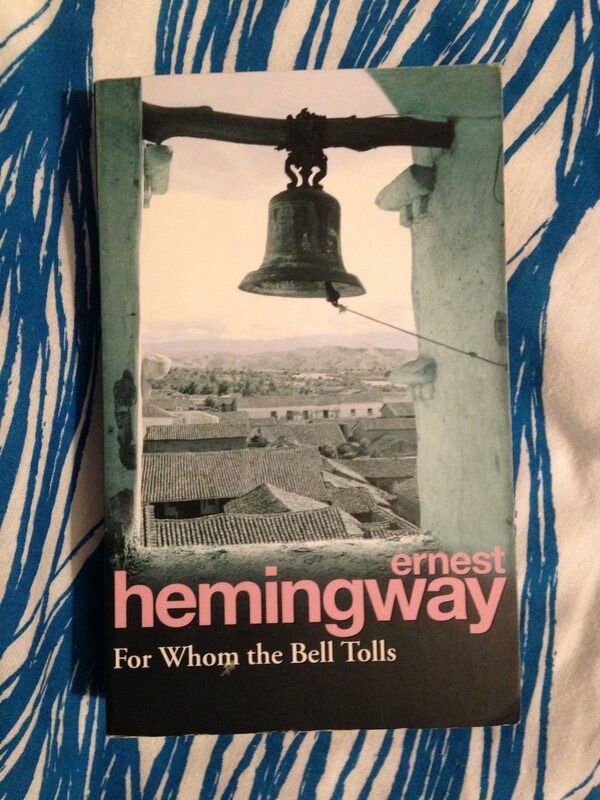 There are many highlights in this novel, not least of which is enjoying Hemingway’s unique and persuasive style of writing. It sits somewhere between journalism, history and adventure. Yet, no matter how truthful and grounded he writes, Hemingway never forgets the main job of any novel, to entertain. In the hands of a lessor writer, For Whom the Bell Tolls would have been a great adventure story, from Hemingway it’s an epic of war, humanity, love and sacrifice. 1) a great Hemingway love story; 2) a tense story of adventure in war; 3) a grave and sombre tragedy of Spanish peasants fighting for their lives. This seems to me a fair summary and a clipped-down opinion that Hemingway would have approved of. Unique in my project to date, Hemingway is an author I know that I’ll return to again and again for the sheer quality of his work. The novel is, as all great works are, many things to many people. The discussion around For Whom the Bell Tolls is not whether it’s a masterpiece, but for which of many reasons each reader believes it is. Ernest Hemingway was born in 1899 and found fame as a writer of novels, short stories and articles. Hemingway is known for his understated realism as a writer, winning both Nobel and Pulitzer prizes in the 1950s.